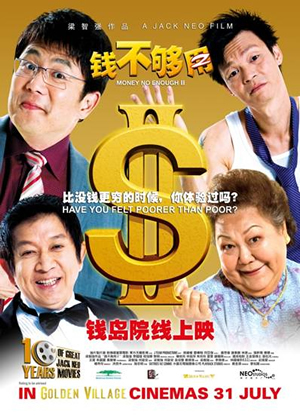 Ten-years since the first Money No Enough, local celebrity auteur Jack Neo’s “Money No Enough 2” returns to bring attention to the common man’s life in Singapore where the pursuit of money is a never ending passion . The oldest brother Yang Bao Hui (by Henry Thia) represents the lower income group. As a child, Hui left school at an early age to earn money to help support his poverty stricken family. He has been working as a delivery man in the same company for the last 30 years. At the persuasion of his younger brother, he strikes out as an entrepreneur to sell health supplements. As business improves, he quits his dead-end job and puts all his time into the business. Unfortunately the business is forced to a standstill when the health supplement is deemed unsafe for public consumption, which inadvertently brings Bao Hui close to financial ruin. The second brother Yang Bao Qiang (by Jack Neo) portrays a well-heeled successful businesman. As the owner of his own business, he and his wife flaunts their wealth in typical Singaporean fashion, with designer clothes, a flashy car and a big house to put it all in. However in a moment of greed, he allows himself to be cheated out of his fortune and gets into a very difficult financial situation. The youngest brother Yang Bao Huang (by Mark Lee) represents the ordinary middle working class. He earns a good salary working as a regional supervisor for a health supplement trading company, and spends lavishly to maintain his ‘wannabe’ lifestyle. When the health supplement business goes bust, debts pile up and Bao Huang too, faces financial ruin. As the winds of fortune changes, the brother’s begin to neglect their elderly mother. It was easy to be generous and filial during the good times but when household budgets tighten, what is the cost of true filial piety? Even the most basic arrangements, including whom mom should stay with, become a contentious issue. It is the filmmaker’s wish that Money No Enough 2, through the ups and downs faced by the three Yang brothers, help us to reflect at our own priorities while giving us a chance to laugh at ourselves.